You are on: DyeStat Home | U.S.
and compete in, the 2008 Millrose Games. Foot Locker - Ashley Brasovan and Mike Fout are surprise winners. Finding Michael Fout - Dave Devine takes a closer look at 2007 Boys champ Michael Fout. She Just Had To Get There - SteveU finds what it took for Ashley Brasovan to become the 2007 Girls Champion. NTN4 Complete coverage of the 4th Nike Team Nationals - regionals in November, finals in Portland OR December 1. State Meet Index - one stop shopping for all 50 state cross country meets. American Rift Valley - Dave Devine tells about the amazing concentration of running success in Spokane WA. Part 1 explores the tradition and landscape. Part 2 looks at the running culture, the Tyson factor and the fraternity of coaches. New Faces of 2007 - 155 freshmen or younger who made DyeStat Elite in 2007 outdoor. DyeStat Athletes of the Year - Matt Centrowitz and Chanelle Price. 2/28/08 NY Eastern States Championships - Union Catholic and Trenton Central NJ both US#1 1:28.35 4x200. West Windsor-Plainsboro South US#1 10:18.76 DMR. 2/16/08 USATF Jr. XC Championships - It's Jordan Hasay and German Fernandez for Cali. Prep Sweep! 1/27/08 Reebok Boston Indoor - Luke Puskedra UT edges past Colby Lowe TX, 4:08.77-4:08.99; Jillian Smith NJ kicks with 150m to go to win in 4:48.83. 1/17/08 Confessions of a Track Junkie - John Nepolitan recounts a last-minute, spur-of-the-moment, weekend jaunt to Scotland to watch a race. 1/8/08 NY 14th Hispanic Games - Kyle Merber and Emily Lipari provided big highlights with Millrose-qualifying mile victories, while Devon Hill, Steve Crouse, Sarah McCurdy and Jenn Clayton won MVP awards. 1/3/08 2008 National Track Preview 3 - The Girls Sprints: Victoria Jordan TX and Chalonda Goodman GA shared many of the best times and honors, but the list of contenders for sprint titles is long and diverse. 12/24/07 2008 National Track Preview 2 - The Girls Hurdles: Super group, including NIN/NON champ Jackie Coward and NON/World Youth Champ Dalilah Muhammad are back for more. 12/21/07 2008 National Track Preview 1 - The Boys Hurdles: William Wynne and Wayne Davis II lead a super group over the barriers. 12/15/07 NY 54th Bishop Loughlin Games - First mega meet of New York Armory indoor season. 11/30/07 The Evolution of NTN - The Dream of NTN is being fulfilled as runners from across the country meet face to face to find out who's truly Number One. 11/30/07 NTN Preview - Rich Gonzalez - Defending champion Manlius NY girls seem unstoppable - Dana Point CA is the pick in a balanced boys field. 11/28/07 Kenyan Pack, Coming Back - Dave Devine previews this year's Kenyan teams, traveling to compete in the boys and girls Open Races for the second year in a row. 11/27/07 NTN Preview - Last Runner Standing - Who has the strength left to win after longest cross country season? Harrier editor Marc Bloom tabs defending champion Fayetteville-Manlius NY girls and Neuqua Valley IL boys as favorites. 11/24/07 NTN Southeast Girls Championship - SE#4 Collins Hill GA and SE#2 Tatnall DE qualify for NTN Finals in Portland OR December 1. 11/24/07 NTN Southeast Boys Championship - SE#1 Oak Ridge TN and SE#2 Jefferson Alexandria VA qualify for NTN Finals in Portland OR December 1. 11/22/07 NTN New York - Girls Preview - Dan Doherty analyzes the NTN New York girls championship race at Bowdoin Park NY November 24. 11/22/07 NTN New York - Boys Preview - DyeStat NY boys regional editor Tom Cuffe sings a little Sinatra and picks the winners - Shen and Warwick. 11/21/07 NTN Southeast - Preview - Top teams ready to settle it on the course at Nike Team Nationals Southeast regional championships at Hoover AL Saturday November 24. 11/18/07 NTN Southwest Regional - Complete coverage. 11/18/07 OR BorderClash - Washington takes the boys and girls races again; Unterreiner and Cochran are individual winners. 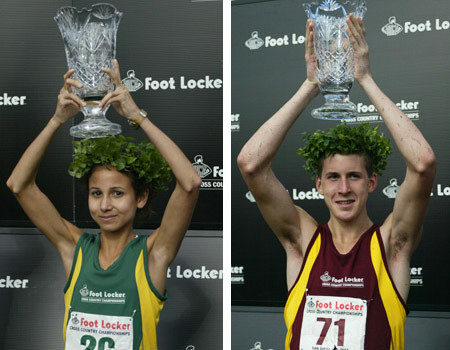 11/16/07 Foot Locker Favorites - National 11/16 Update - Chris Derrick IL joins Jordan Hasay CA as US#1s. 11/14/07 NTN Southwest - Preview - Our regional editor Sal Gonzales sees heavy favorites in girls race and a shootout in the boys race. 11/10/07 NTN Midwest Regional - Four teams qualify for NTN Championships in regional meet at Terre Haute IN. 11/9/07 NTN South Preview - Analysis of early entries for NTN South regional championships at The Woodlands TX November 17. Top ranked contenders list filled with NTN veterans and runners who raced the course at Nike South Invite. 11/8/07 NTN Midwest Preview - Runners from Ohio, Indiana, and Illinois state championship teams will clash at Terre Haute Saturday for four slots in the 4th Nike Team Nationals cross country championship at Portland OR Dec. 1. 11/8/07 NTN Northwest Preview - Rankings are out - face to face is in. Nearly all the top teams will be on the starting line in Boise Saturday Nov. 10. 11/4/07 Inspiration and Sadness at Marathon - Loss of Ryan Shay at Olympic Trials Marathon saddens us after triumphs of "DyeStat Alums" Ryan Hall and Dathan Ritzenhein, and Brian Sell - SteveU Column/John Nepolitan Pix. 11/2/07 DyeStat XC Regional Rankings - Week 8 - Georgetown TX boys and Dakota Ridge CO girls move up to #1. 10/26/07 10 Nike Elite Athletes will be Nike reps at Nike Team Nationals regional championships in November and regional team captains at NTN finals in Portland Dec. 1. 10/26/07 DyeStat XC Regional Rankings - Week 7 - Murrieta boys teams take over 1-2 in California after Mt. SAC. Rest of country is stable. 10/13/07 Manhattan Invitational - a Stellar Manhattan - Girls Eastern States lives up to its hype with smash victories by Carly Seymour PA and Fayetteville-Manlius NY. Harrier US#1 Danbury CT wins battle of DyeStat regional #1 boys teams over Oakton VA.
9/21/07 DyeStat XC Regional Rankings - Week 2 - Rogers AR (South) and Murrieta Valley (California) ride stunning wins at Missouri Stampede and Woodbridge Invitational to second place in their regions. 9/14/07 DyeStat XC Regional Rankings - Week 1 -- first in-season update has 5 new regional leaders and 48 new teams in regional top 10 lists. 9/4/07 Spokane WA - American Rift Valley? -Pt 1 - How to explain the persistent pool of talent from this one mid-sized American city? Part 1 of a two-part story. 9/1/07 Foot Locker Favorites - The Girls National Scene - Jordan Hasay is better than ever and Kathy Kroeger and Aurora Scott will have to overcome adversity and inactivity if they want to be the best. 8/31/07 DyeStat XC Regional Rankings - DyeStat's pre-season picks as the top 10 cross country teams in each region. 8/30/07 Foot Locker Favorites - The Boys National Scene - Johnson, Lowe, Keveren and others have various credentials to back up a top ranking - who are you gonna pick? 8/27/07 DyeStat 2007 Year-End Awards - DyeStat Athletes of the Year and Most Outstanding Performers. 8/21/07 2007 Pre-Season Super 25 - Danbury CT boys and Fayetteville-Manlius girls head Marc Bloom's national cross country team rankings in 32nd year of Harrier Magazine. Half of 50 teams were unranked in the final 2006 Super 25. 7/20/07 Magic Moments on DyeStat - John Dye recalls some of the most memorable moments in the first 10 years of DyeStat. 7/17/07 World Youth Analysis - The View from The U - SteveU Shares his Highs, Lows and Interesting Notes about Team USA at the World Youths Championships. 7/15/07 IAAF World Youth Championships - Reports on all 5 days from Ostrava, Czech Republic. 7/9/07 USATF Youth Nationals - 6-day meet featuring athletes who would go to Ostrava for the World Youth Champs. 7/8/07 Pan American Junior Championships - . 6/29/07 NTN Regional Championships - Nike announces format of new regional cross country meets, including selection process for seeded races. 6/25/07 US Junior Nationals - reports on entire meet, including some senior events. 5/24/07 Team USA World Youth analysis - Mike Kennedy says US may have trouble threepeating this year. 5/6/07 Don Mitchell Roosevelt Memorial - Jackie Coward 13.40/41.94 100H/300H double, Cleveland Heights boys US#1 7:42.15 4x800. 4/21/07 NTN Regionals - Announcement of Regional dates and sites for 2007 Nike Team Nationals. 3/20/07 Nike announces NTN will have regionals - Regional meets will replace rankings to select teams for 2007 Nike Team Nationals in Portland OR December 1. 2/17/07 - Simplot Games - Pocatello ID - Bianca Knight sets new national indoor 200 meter record. 1/27/07 - MA Reebok Boston Indoor - Duncan Phillips TX US#1 4:09.20, Matt Centrowitz MD 2nd 4:10.85. Danielle Tauro NJ and soph teammate Jillian Smith go 1-2 4:52.20/4:53.58. 1/21/07 - NY Millrose Selectees - Danielle Tauro and Steve Murdock are top seeds. 1/20/07 - TX Carl Lewis Invitational - Rynell Parson TX just misses US soph 60 mark again. 1/20/07 - CT Yale Classic - Steve Murdock 4:15.21 mile and Hannah Davidson 9:52.83 3k race to US#1s. 1/20/07 - NC Eastern Challenge - Johnny Dutch rips a USR 7.07 55H on his 18th birthday. 1/20/07 - NV Reno PV Summit - US#1s for Maston Wallace TX 17-00 and Tori Anthony CA 14-00. 1/13/07 - NY Molloy Stanner Games - Brittany Sheffey NY US#1 4:54.09 leads 5 US#1s, plus Walter Henning NY 84-10.25 WT (his #4 ever), 61-02 SP. 1/13/07 - AR Arkansas Invite - Bianca Knight MS US#1 23.27 (.01 off PR), Rynell Parson TX US#2 6.77 60/US#1 21.62 (US Soph record). 4 more US#1s. 12/27/06 - NY Marine Corps Classic - Blazing 800s and DMRs. DyeStat was on-site at all three Foot Locker regionals Nov. 25. CLICK BELOW FOR COMPLETE COVERAGE. We have posted complete results, winners photos and summaries. NE Boys - Craig Forys wins, Sintayehu Taye 2nd. NE Girls - Neely Spence and Carly Seymour, who finished 1-3 for Pennsylvania, practiced relaxation techniques to succeed. SO Boys - Ryan Hill NC surprises favorites, catching Girma Mecheso in the third mile. Now he looks to get some respect for the South. SO Girls - Aurora Scott VA 16:25, Kathy Kroeger TN 16:32, both beating Erin Keough's 20-year-old meet record. Scott's goal for San Diego: "I'm going out there to win it." MW Boys - Hassan Mead MN wins; Illinois favorites Evan Jager and Kevin Havel fail to qualify. MW Girls - Omaha freshman Emily Sisson runs a race to remember. 11/11/06 - Foot Locker Favorites - update 2 - Steve Underwood takes a closer look in mid-November. 11/5/06 - NTN Selection Sunday #1 - first 16 teams invited. 10/28/06 - Rocky Mountain Championships - new regional meet features teams from Idaho, Montana, Wyoming, Utah and Colorado. 10/25/06 - NTN Selection Sunday Schedule - 2006 Nike Team National teams, 20 boys and 20 girls, will be picked on four Sundays in November. 10/14/06 - Manhattan Invitational NY - Craig Forys' 12:10.7 (Colts Neck NJ sr) topples 23 year-old record, only to lose it minutes later to Tommy Gruenewald's (Fayetteville-Manlius NY sr) 12:10.6. 10/1/06 - College Choices 2007 - With the early letter of intent signing period looming (Nov 8-15), we have opened up a College Choices page for the class of 2007. 9/22/06 Harrier Super 25 Update 1 - Royal Simi Valley CA boys and Hilton NY girls are US#1. steveu's Foot Locker Favorites - Pre-Season - West girls - A tough road ahead -- if you're not Jordan, Mel or another Cali girl. steveu's Foot Locker Favorites - Pre-Season - Midwest boys - a big two of Jager and Turner, and then eight big question marks. steveu's Foot Locker Favorites - Pre-Season - Northeast boys - 8 top runners could win it all or lose it all in unpredictable region. steveu's Foot Locker Favorites - Pre-Season - Northeast girls - Tauro leads deep, deep field, with 22 of last year's top 28 girls returning. Pre-Season Harrier Super 25 - Hilton NY girls and Mead WA boys are US#1 in Marc Bloom's national cross country team rankings. steveu's Foot Locker Favorites - Pre-Season - National girls - They'll be chasing Jordan, Mel and Danielle. 2006 NTN pre-season rankings - top 10 boys and girls cross country teams in each of 8 regions. World Juniors Day 6 Coverage - relays conclude the meet. World Juniors Day 5 Coverage - USA advances to finals in all four relays. Darius Reed makes 110H final. World Juniors Day 4 Coverage - Chris Carter (400H) wins gold!!! Bronze for Rebekah Noble (800) and Tiffany Ofili (100H) - Gabby Mayo (200) is 5th - John Hickey (SP), Erin Bedell (1500) advance to finals. World Juniors Day 3 Coverage - Two more silvers, this time to Nicole Leach in the 400H and Justin Oliver in the 400. Also, US sprinters, hurdlers advance in 200 and 100H rounds. Gabby Mayo and Chris Carter win semis in the 200 and 400H. World Juniors Day 2 coverage - Gabby Mayo 2nd in 100m final; several others advance. China from 38,000 feet and Beijing on the ground - Mike Byrnes' trip from Virginia to Beijing via the North Pole, sans deodorant and after shave lotion -- -- plus what he sees when he lands. IAAF Pre-Meet Press Conference - Comments about the meet from officials and select athlete interviews, including Ebony Collins. US chances at World Juniors - Doug Speck and Mike Kennedy preview Americans on eve of meet.